Objective Association of lifestyle modification and pharmacological adherence among patients with hypertension attending a national referral hospital in Kenya. Setting Medical wards and outpatient clinic of a national referral hospital. Participants Patients (n=229) diagnosed with primary hypertension for at least 6 months. Primary outcomes Clinical makers, cholesterol levels, anthropometrics, lifestyle/dietary habits adjusted for age, gender and education; antihypertensive adherence; views on prevention of hypertension and adequacy of hypertension information. Results Ageing was associated with elevated diastolic blood pressure (BP) (p<0.05), heart rate (HR) and cholesterol. Females had higher body mass index (BMI). More males reported drinking alcohol and smoking (p<0.001), especially the highly educated. Higher BPs were observed in smokers and drinkers (p<0.05). Daily vegetables and fruits intake were linked to lower BP, HR and BMI (p<0.05). Intake of foods high in saturated fat and cholesterol were associated with raised HR (p<0.05). Respondents on antihypertensive medication, those engaged in healthy lifestyle and took their prescribed medications had lower mean BPs than those on medication only (138/85 vs 140/90). Few respondents (30.8%) considered hypertension as preventable, mainly the single and highly educated (p<0.05). Respondents (53.6%) believed they should stop taking their antihypertensive medication once hypertension is controlled. Conclusion Missed targets for BP control and hypertension-related risks are associated with ageing, female gender, fast food and animal fat intake. Alcohol and smoking is common in males associated with poor BP control. Daily vegetables and fruits intake are associated with better BP control and overall hypertension risk reduction. Observed suboptimal BP control despite pharmacological adherence suggests lifestyle modification is needed besides antihypertensive medication. Interventions should address modifiable risk factors aggravated by age and adverse lifestyles through adopting combined lifestyle modification, pharmacological adherence and tailored expert delivered hypertension-related information. This is the first study to objectively demonstrate the link between alcohol, smoking, dietary practices and blood pressure control in individuals with established hypertension (HTN) in Kenya. The identification of a critical knowledge gap among individuals diagnosed with HTN on the preventable nature of HTN and the requirement for lifelong treatment of HTN. The focus on the need for respect and authority for Kenyan health professionals in the management and prevention of HTN; putting the responsibility on them to lead in campaigns against HTN. The study was limited by its cross-sectional design. Assessment of smoking, alcohol consumption and dietary habits capture information at one point in time potentially missing variability in health behaviours and medication practices. Interventions that promote adherence to lifestyle modification and pharmacological therapy are critical in the management and prevention of hypertension and its associated complications. The interventions complement each other, with dual benefits. Healthy patterns consist of daily habits performed deliberately for the long term (months to years). These lifestyle habits include healthy nutrition and moderate alcohol, physical activity, not smoking and maintenance of optimal body weight and have been associated with controlling, moderating and lowering blood pressure levels.23–26 The non-pharmacological interventions can either be adopted as an initial treatment, or in combination with drug therapy. Indeed, the adoption of healthy lifestyle behaviours has been credited with reduction in the use of antihypertensive medications,27 increased fitness, health and productivity. Beyond lifestyle modification, pharmacological therapy also plays a critical role in modulating and lowering blood pressure in individuals with hypertension seeking professional interventions for the disease. The classes of antihypertensive medications that are used in managing patients with hypertension include ACE inhibitors and angiotensin receptor blockers both of which are effective and well-tolerated options for starting and maintaining antihypertensive regime. Additionally, diuretics, calcium channel blockers, beta-receptor blockers and thiazides have blood pressure-lowering effects and have been used extensively. These antihypertensive drugs are used alone or in combination depending on the patient response and blood pressure control achieved.28–30 The antihypertensive medications are found in private specialist clinics, as well as in level 4, 5 and 6 public hospitals in Kenya. Furthermore, hypertension-related interventions are shared with patients through health education, print, electronic and direct clinician-patient interactions. Once initiated, it is important to monitor the effectiveness of the interventions through routine reviews and measurement of clinical markers including anthropometrics and blood pressure levels. Studies on whether patients with hypertension adhere to lifestyle modifications with the same enthusiasm as pharmacological therapy are lacking in Kenya. Therefore, we sought to investigate the association of lifestyle modification and pharmacological adherence on blood pressure control among patients with hypertension at the largest level 6 hospital in Kenya. This study was conducted at KNH, a level 6 referral and teaching public health facility in Nairobi. KNH offers both outpatient and inpatient specialty services including emergency, obstetrics and gynaecology, medical, surgical, oncology, cardiology, diabetes, hypertension and paediatrics medicine and related interventions among others. The study included patients with hypertension attending the medical outpatient clinic as well as those admitted in the medical wards. The study used a descriptive cross-sectional design and included randomly selected respondents (n=229) from the medical outpatient clinic and the medical wards. During the study period, the outpatient clinic offered services to 1760 patients while the medical wards admitted 448 patients with hypertension. Accordingly, based on the adopted formula from Mugenda and Mugenda,31 an estimated sample size of 256 was calculated. Through proportionate calculation, 205 respondents were sampled from the outpatient clinic, while 51 were sampled from the inpatient wards. Systematic random sampling was applied to select the study respondents once their files were obtained and scrutinised for the inclusion criteria (figure 1). A total of 2208 patients were identified and divided by the minimum adjusted sample size of 256 to arrive at a sampling interval of 8. Thereafter, every eighth patient was included in the sample until the desired sample size was attained. Twenty-seven respondents had incomplete information and were excluded from the study. Flow chart for the study inclusion criteria. A total of 229 respondents were included in the study. HTN, hypertension. Data were collected using a researcher-assisted semi-structured questionnaire. The questionnaire was pretested on patients (n=10) with hypertension admitted to one medical ward at KNH. The results from the pretest were analysed and used to determine the final questionnaire. The questionnaire consisted of closed and open-ended questions that captured information related to: demographic characteristics, knowledge about hypertension, management of hypertension, lifestyle factors, views on hypertension and its management, adherence to medication and lifestyle changes as well as clinical and anthropometric parameters. Eligible respondents were interviewed and examined for inclusion criteria by trained nurses as research assistants. 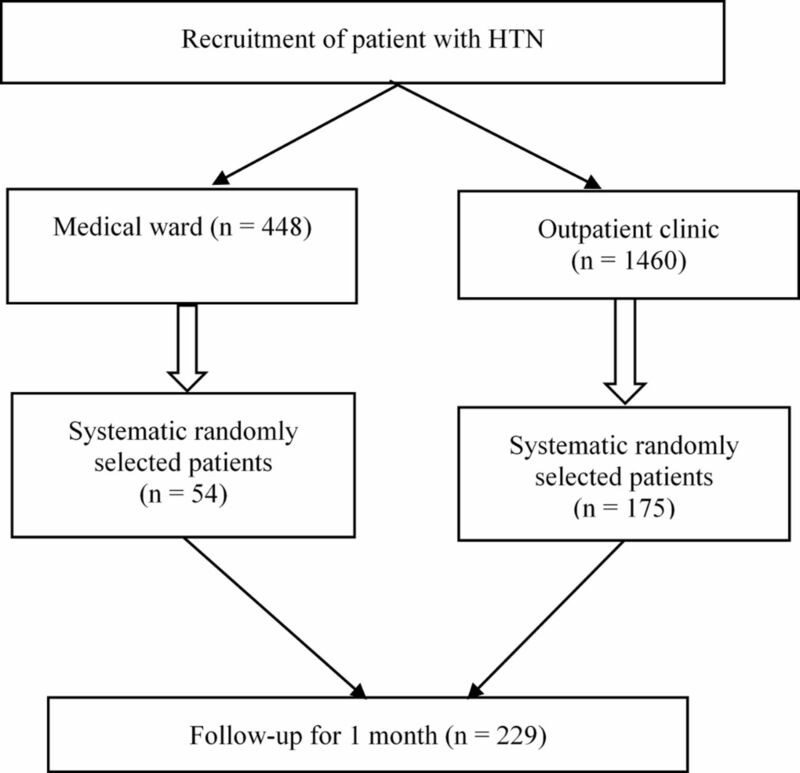 The criteria for inclusion in the study included: a diagnosis of essential hypertension, on antihypertensive medication and/or lifestyle modification interventions for elevated blood pressure (≥140/90 mm Hg), attending follow-up at medical outpatient clinic for at least 6 months or admitted in the respective medical ward. The clinical and anthropometric measurements were performed after informed consent was obtained. The cholesterol levels were obtained from the patient file and recorded in the study checklist. Clinical variables. Hypertension was defined according to the Seventh Report of the Joint National Committee on Prevention, Detection, Evaluation, and Treatment of High Blood Pressure (JCN7) criteria as having a systolic blood pressure of ≥140 mm Hg or a diastolic blood pressure of ≥90 mm Hg or being on medication for hypertension.2 In this study, respondents with systolic blood pressure of <140 mm Hg and a diastolic pressure of <90 mm Hg were considered controlled. Similarly, those with systolic blood pressure of >140 mm Hg and a diastolic pressure of >90 mm Hg were considered not controlled. Respondents were requested to sit and relax in a quiet room for 5 min before their radial arterial pulse and brachial blood pressure were taken on the right arm. Measurements were obtained twice in the sitting position for outpatients or supine position for hospitalised patients using appropriate cuff sizes. Blood pressure and heart rate were measured with an automatic blood pressure monitor (OMRONM4, Omron Healthcare GmbH, Hamburg, Germany), with the final value calculated as the average of two consecutive measurements in the same arm. Total cholesterol measures were obtained from the patient file. All measurements were recorded in the study checklist. Sociodemographic and lifestyle variables. Sociodemographic information, specifically age, marital status, level of education, history of smoking and consumption of alcohol were obtained from each respondent using a researcher-assisted standardised questionnaire. Food intake and dietary patterns. Self-reported information about food consumption patterns was collected using a questionnaire derived from the Diet History Questionnaire-NIH32customised for use in Kenyan settings. Researchers assisted the patient in completing the questionnaire. The questionnaire assessed dietary patterns and modification made by the patients since they were diagnosed with hypertension. The main focus of the questionnaire was general dietary patterns in regard to frequency (daily, weekly, monthly), and amount of meat, vegetables, fruits and beverages such as alcohol intake. Anthropometric variables. Anthropometric measurements including weight, height, body mass index (BMI) and waist circumference were measured using standardised methods. Waist circumference was determined by measuring the waist at midpoint between iliac crest and lower border of the tenth rib, with an average of three measurements considered as the final value. Using the International Diabetes Federation criteria33 that is gender-specific and ethnic-specific, a waist circumference of ≥94 cm for men and ≥80 cm for women were considered abnormally high. BMI was calculated based on weight in kilogram divided by the square of height in metres (kg/m2). The weight and height were obtained using weighing scale with a stadiometer (Seca GmbH, Germany) and these values were used to calculate the BMI. The height was measured and recorded to the nearest 0.1 cm, while the waist circumference was measured with a non-stretchable tape measure to the nearest 0.1 cm. Adherence to antihypertensive medications. Adherence to antihypertension medications was determined by asking the patient to report the name, dose and frequency of prescribed medications they took during the period preceding the appointment. This information was validated by checking the clinical records and reconciling the number of tablets that had been taken and the number remaining in the patients pill pack. Thereafter, the information was recorded in patient medical file. Knowledge on hypertension and its management. Data on hypertension and its management were obtained using questions targeting the patients’ views regarding the preventable nature of hypertension, adherence to antihypertensive medications, the duration the treatment last and how information on hypertension should be shared by the clinician. Data were organised, screened and checked for completeness. Data were coded and entered into the computer and cross-checked with the original source for accuracy. Analyses were performed using computer software (SPSS V.22). Descriptive and inferential statistics were generated, interpreted and reported. Specifically, descriptive data were analysed using proportions and summarised in frequency tables. Fisher’s exact test and Χ2 test of independence were used to establish the relationships between sociodemographic variables (age, gender, education, marital status and religion) and smoking, alcohol consumption, respondent’s views on prevention and availability of information on hypertension. Analysis of variance was performed to establish differences between clinical variables (blood pressure, heart rate), total cholesterol and anthropometrics (BMI, waist circumference) measurement across age, gender and dietary patterns. Logistic regression was performed using forward selection to determine factors associated with blood pressure control. The removal and inclusion of probabilities into the models were set at p values of 0.20 and 0.10, respectively. The cut-off point for the level of significance was set at p<0.05. Prior to the commencement of data collection, verbal and written consent was obtained from patients with hypertension who met the inclusion criteria following a detailed explanation about the study goals and procedures. Patients and members of the public were not involved in developing the research questions and design of the study; however, the recruitment of respondents involved patients and members of the public after a comprehensive explanation of the study including obtaining consent. The results will be disseminated to the public during health message sharing sessions in the outpatient clinic. 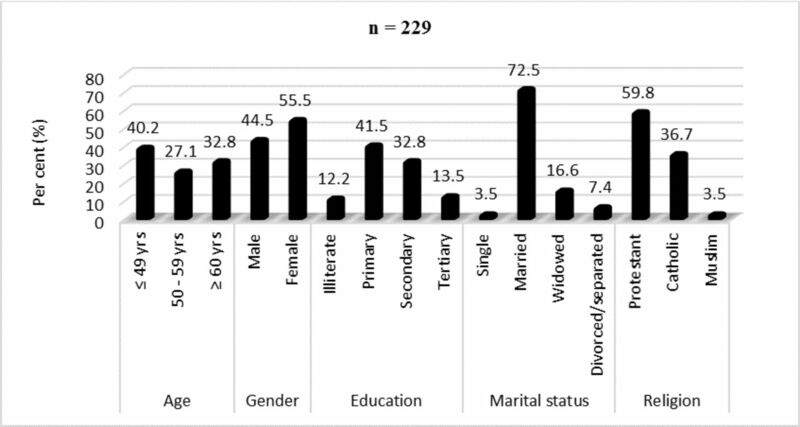 The sociodemographic characteristic (age, gender, educational attainment, marital status and religion) of the respondents are presented in figure 2. The sample was fairly young (40.2% aged below 50 years) and female (55.5%), had limited educational attainment (primary or less; 53.5%), were married (72.5%) and of the Christian faith (96.5%). Figure 2 provides more details on the sociodemographic categories. Demographics of the respondents. A higher proportion of the respondents were females (55.5%), below 60 years (67.3%), married (72.5%), Protestants (59.8%) with primary level of education (41.5%). The clinical makers, anthropometrics and total cholesterol levels stratified by age and gender are presented in table 1. The overall mean value and SD for these variables included: systolic blood pressure of 139.45±14.1 mm Hg , diastolic blood pressure 89.18±12.8 mm Hg and a heart rate of 81.8±9.3 (mean±SD) beats per minute. The mean BMI was 28.88±4.2 (mean±SD) kg/m2, the mean waist circumference of 81.45±24.9 (mean±SD) and hip circumference at 95.55±29.1 (mean±SD) cm, respectively. Further analysis stratified by age and gender (table 1) revealed that respondents aged 50–59 years had significantly higher DBP (F2, 220=3.248; p<0.05) mm Hg, heart rate (F2, 212=6.194; p<0.05) and total cholesterol (F2, 145=3.136; p<0.05) mmol/L, respectively. In addition, females had significantly (t2=2.021; p<0.05) higher BMI compared with males. Among the respondent whose blood pressure was measured, only 34.8% had their blood pressure controlled (table 2). Successful blood pressure control was defined as <140 mm Hg systolic and <90 mm Hg diastolic. Further analysis with independent samples t-test revealed a statistically significant association between BMI and blood pressure control. Respondents with lower BMI (27.89 kg/m2) were more likely to have their blood pressure controlled (t=2.686, df=216, p=0.008) compared with their counterparts with higher BMI (29.46 kg/m2). Self-reported smoking and alcohol consumption among respondents relative to gender, educational attainment and blood pressure control are presented (table 3). Overall mean values for the sample included; 13.1% had a history of drinking alcohol and 8.3% smoked. Many of those who reported smoking (31.6%) had done so for over 10 years. A majority (94.4%), however had not attempted to stop despite having been advised (89.5%) by a doctor. Further analyses observed that males were more likely to report smoking compared with females (x2=16.93; df=1; p<0.001). Self-reported alcohol consumption was associated with male gender (p<0.001). (x2=11.59; df=1; p<0.001), higher educational attainment (x2=12.82; df=1; p<0.001) and poor blood pressure control (x2=7.047, df=1, p=0.012). The association between smoking and blood pressure did not yield any statistically significant difference. Adherence to taking prescribed medication for hypertension and heart healthy lifestyle practices are presented (figure 3). A majority of the respondents (85.2%) took medication as prescribed, 75.5% consumed vegetables and 44.1% ate fruits daily. The majority of the respondents (55.5%) never ate fast foods, but 31% consumed a meal with high animal fat content on daily basis. Respondents who reported adherence to medication in addition to adherence to heart healthy lifestyle behaviours were more likely to have lower blood pressure than those who only took medications (138.42/85.08 mm Hg vs 140.08/88.92 mm Hg); however, these differences were not statistically significant (table 4). Adherence to pharmacological therapy and lifestyle modification. A higher proportion of the respondents took medicine as prescribed (85.2%), never forgot to take medicine (77.7%), consumed fruits (44.1%) and vegetables daily (75.7%) and never ate fast foods (55.5%). The clinical, cholesterol and anthropometric measurements relative to dietary patterns among respondents are presented (table 5). Respondents who reported consuming vegetables on daily basis had lower systolic blood pressures (F2, 216=3.490; p<0.05) and diastolic blood pressures (F2, 215=3.793; p<0.05). Similarly, lower heart rate was observed with those who consumed fruits (F2, 207=10.845; p<0.001) and vegetables (F2, 207=13.025; p<0.001) on daily basis. Additionally, respondents with low BMI were associated with daily consumption of fruits (F2, 211=4.582; p<0.05) and vegetables (F2, 211=5.184; p<0.05), while low cholesterol levels were linked to daily consumption of fruits alone (F2, 140=3.499; p<0.05). Adverse health behaviours including daily consumption of fast foods (F 3, 206=3.196; p<0.05) and meals high in animal fats (F2, 207=7.047; p<0.001) were linked to higher heart rate. A logistic regression was performed with blood pressure control as the dependent variable and alcohol consumption, and BMI as predictor variables (table 6). The logistic model yielded statistical significance (x2=16.418, df=3, p=0.001). Individuals who consumed alcohol were 77% less likely to have blood pressure controlled (OR=0.229 (95% CI 0.066 to 0.793), p=0.02). Individuals who had higher BMI were 8% less likely to have blood pressure controlled (OR=0.919 (95% CI 0.855 to 0.988), p=0.023). The views of respondents on prevention of hypertension relative to their sociodemographic characteristic are shown in table 7. Overall, only 30.8% of respondents viewed hypertension as preventable (table 7). Further analyses with Χ2 test of independence revealed the respondents who reported their marital status as single (x2=13.53; p<0.05) and had higher educational attainment (x2=2.16, df=6; p<0.001) were more likely to hold the view that hypertension is preventable. The respondents’ views on availability of adequate information on hypertension relative to their sociodemographic characteristic are shown in table 8. Overall, only 16% of respondents viewed the available information on hypertension as adequate. Those of higher educational attainment, were more likely (x2=16.07; p<0.05) to report that hypertension information was inadequate compared with those with primary and no formal education. The respondents’ views on dissemination of information on the management of hypertension is shown table 9. Once their blood pressure was controlled, the vast majority of respondents (72.4) believed that medication should be stopped or they did not know what to do. The respondents preferred dissemination of medical information about hypertension to be done through radio broadcast programmes facilitated by health professionals. In addition, a majority (86.5%) indicated that the best way to remind them of their upcoming appointments was for this to be indicated on the patients’ card. The primary aim of this study was to investigate the association of lifestyle modification and pharmacological adherence on blood pressure control among patients with hypertension. The sample was drawn from patients with hypertension at a national referral hospital in Kenya. To address the main question, the following specific parameters were measured: clinical makers (blood pressure, heart rate and cholesterol levels); anthropometrics (BMI and waist circumference) (risk levels adjusted for gender); lifestyles habits (smoking, alcohol, dietary habits including vegetables, fruits, fast food and animal fat); pharmacological adherence and views on prevention, antihypertensive medication duration and adequacy of hypertension information. Our findings revealed that clinical, cholesterol and anthropometric measurements including blood pressure, heart rate, BMI, cholesterol, waist circumferences were abnormal. Blood pressure, heart rate and total cholesterol were higher in patient 50–59 years of age compared with other age categories. Females were observed to have higher BMI values compared with males; males were more likely to have smoked and consumed alcohol with those having higher educational level more likely to engage in this behaviour. Those who reported consuming alcohol had higher blood pressure values. Patients adhered to prescribed medications more than heart healthy lifestyle patterns, however only a small percentage consumed fast foods and meals with high animal fats. Daily vegetable and fruit consumption was associated with healthier levels for heart rate, BMI, blood pressure and cholesterol. Higher heart rates were associated with daily consumption of fast foods and meals high in animal fats. Of note, and critically important to prevention and management, hypertension was viewed as preventable only by a few respondents; most patients had inaccurate or incomplete information on what to do with their medication once their blood pressure was controlled. Additionally, respondents believed that the available hypertension-related information was inadequate, that dissemination of hypertension-related information should preferably be through radio programmes facilitated by medical experts and that reminders for appointments should be recorded on the patients’ cards. These findings inform the narrative discussion below. The study sample exhibited abnormal clinical-anthropometric parameters including systolic and diastolic blood pressure, heart rate, BMI, waist circumference and total cholesterol consistent with the diagnosis of hypertension and associated cardiometabolic risk factors. These abnormal levels are consistent with known association between the variables and hypertension.34–36 Patients aged 50–59 years showed substantially higher blood pressure, heart rate and cholesterol relative to other age categories. This is difficult to explain given that these physiological parameters ordinarily increase with age, more so from 45 years among men and 55 years in women, respectively,37 but similar findings were posted recently from studies conducted in China.34 It is worth noting that the reference group is different with unique demographic characteristics, with only hypertension-related risk factors as the common denominator.6 8 In this study, females had higher BMI measures and rates of obesity (BMI ≥30 kg/m2) compared with their male counterparts; similar findings have been shown in other Kenyan studies.38 Additionally, in studies from other countries, obesity is more prevalent in women (14%) than men (14% vs 10%).34 38 The gender difference can be explained by differences in the body muscle-fat composition, and lower activity levels in females,34 as well as accessibility to food stuffs while shopping, preparation and cooking. Related to the aforesaid, men, more so than women, are exposed to environments where smoking and alcohol consumption is accepted. Women’s lives are often governed by traditional and cultural expectations for modesty behaviour, typically limiting or prohibiting drinking and smoking and their role as mothers and stewards of the family health further distance them from smoking and consuming alcohol. In addition, physiologically, alcohol tolerance capacity is lower in women due to reduced rates of gastric alcohol metabolism compared with men,44 and smaller volumes of body water in which alcohol is distributed,45 46 resulting in less alcohol having an enhanced effect. It has also been reported that women are more prone to unpleasant acute effects from alcohol (eg, hangovers),47 relative to men,48 49 characteristics which might inhibit women’s drinking. Interestingly, we observed the association between alcohol consumption and higher educational level. Individuals with higher educational attainment may be at higher risk of alcohol consumption because of relatively higher income. Additionally, because of prolonged years of schooling and exposure to drinking environments, many men commence alcohol consumption while schooling due to peer pressure and stress. Similar patterns, with some differences, have been shown in other countries. Studies show alcohol consumption is disproportionately higher in males compared with females with some association with socioeconomic differentials. For example, in the USA, drinking is associated with lower educational levels among men, but higher educational levels among women; among the Korean, alcohol consumption is associated with being without partner among women; while in Australia, drinking is associated with higher income.50 Although these studies were conducted in western countries, parallels and differences can help shape the Kenyan approach to tobacco and alcohol consumption. Surprisingly, in our study, very few patients thought the condition was preventable, although those who reported single marital status and having higher educational attainment were more likely to endorse hypertension as a preventable disease than their counterparts. Our population is more familiar with the treatment of communicable and perhaps this finding reflects the approach to communicable diseases where once the desired outcome is achieved the medication is discontinued. Nonetheless, it is a compelling reason for the healthcare system to improve efforts to raise awareness on the chronic nature of hypertension treatment. The inaccurate and incomplete understanding of factors associated with prevention of hypertension provides an important window of opportunity for understanding the gaps in adherence to hypertension treatment and can help guide mitigation mechanisms. Individuals who reported being single (unmarried) and having higher educational attainment may perceive the risk of hypertension on their health to be high, prompting them to search for information on healthy living as well as to expert help.87 88 Other studies have observed that perceived risk is one of the key factors associated with promoting healthy behavioural changes, with those perceiving risk for some adverse event more likely to take preventive action.89 Individuals in our study with higher educational attainment exhibit higher knowledge regarding prevention of diseases than individuals with lower educational attainment. Education raises awareness of health promotion and prevention including risk factors, and healthy lifestyle behaviours including early screening. Studies have reported that hypertension and its risk factors are relatively unknown to people of lower education level.90 Our findings mirror a report regarding hypertension among Kenyan military personnel in which those of higher educational level practised healthier lifestyle behaviours compared with individuals with low educational attainment.35 Additionally, higher educational attainment is associated with higher socioeconomic status—a factor linked to disease awareness and health seeking behaviours.87 88 91 Being single however, may provide an opportunity for seeking health tips with resultant health awareness, and participation in health-related activities, for example, reading healthy literature, exercises or watching health messages compared with married individuals who are busy with family matters including their children and spouse. Participants in our study who reported higher education attainment felt that publicly available information on hypertension prevention and treatment was inadequate, preferred its dissemination through radio by healthcare experts and wished reminders of upcoming appointments should be made on their patient cards. Education has been reported to be a proxy or marker of socioeconomic status.92 Thus, higher educational level is likely associated with higher income status facilitating ownership of internet and internet-enabled electronics which in turn may increase access to health-related activities. Improved access can boost knowledge and compliment the expert-shared messages. These findings are consistent with reports where patients wanted advice from healthcare professionals to avoid ‘self-harm’, and felt doctors and nurses did not provide enough information and thus looked for information from other sources such as the web, media or medical magazines.93 In addition, information given to patients when attending health messaging sessions at health facilities is often generic and meant to accommodate diverse educational backgrounds. This calls for healthcare professionals to step up and offer patient-centred individualised information based on patient needs. The recommendation for radio dissemination of hypertension-related information by medical experts underscores the important role played by radio and the health experts in sharing information about hypertension-related prevention and treatment. Indeed, there are numerous radio channels that can reach the majority of the population at relatively low cost to the individual. Additionally, most of the mobile phones in Kenya are radio frequency enabled meaning that they do not depend on internet access, minimising cost but ensuring wide coverage of information dissemination. The patients recognised many sources of information, but they recommended that experts should use the radio programmes to educate the public. This underscores the confidence patients have in health professionals and suggests that health experts have an obligation to participate in hypertension prevention/awareness as well as treatment. It is also a wakeup call for health professionals to keep abreast with current best practices in hypertension-related issues and management. The professionals should make deliberate efforts towards educating the public on non-communicable diseases including hypertension. Awareness and educational messages by the health professional should clarify the false impression that ‘taking hypertension-related medications should be stopped once the problem is controlled’, a finding observed in this study. The messaging should include the complications that can be attributed to discontinuation of treatment including coronary and cerebral artery events such as myocardial infarction and strokes and their implications for the patient. Although drug discontinuation may be related to misconception and inadequate information, other factors, for example, lack of finances to buy the drugs may also have a role in non-adherence. In this regard, policy makers should be lobbied to allow health insurance to pay for antihypertensive medications and investment in availing cheap generic quality brands. Additionally, the health education model should mirror approaches adopted for the prevention and management of HIV/AIDs, where people were flooded with HIV/AIDs messages that bore very promising results. Thus, communication and health messages on risk factors, management and prevention of non-communicable diseases need to be amplified through such messaging to realise success. There are several limitations to our study. The assessment of smoking, alcohol consumption, dietary adherence and medication adherence were cross-sectional, conducted at one point in time by asking patterns of patient practices and habits. Self-reported health behaviour patterns and practices captured at one point in time may not fully capture the person’s lifestyle as patterns may vary over time. This is a limitation of cross-sectional designs, but the findings are temporally related to the clinical and anthropometric measures reported in the study which adds to our confidence in the results. In addition, the data may have suffered from recall bias as patients sought to recall health behaviour patterns. The findings from this study will inform the next study to be conducted to answer this important question. Medication compliance was self-reported by questionnaire and not verified using biological markers. Medication reconciliation with the medical record and pill count enhanced the rigour but did not fully eliminate the potential for the error. The study also did not assess salt intake, stress and activity profiles which are important components in hypertension risk assessment. Finally, although we showed important associations this was a cross-sectional descriptive study which precludes our ability to make causal inferences. In addition, the small sample size may not have power to detect statistical difference between some variables where we showed clinically relevant associations. In conclusion, findings from this study revealed advanced age was associated with missed targets for hypertension-related risk factors and blood pressure goals. Female gender, fast food and animal fats were associated with missed target for hypertension-related risks. Smoking and alcohol consumption was higher in males, especially those of higher educational attainment. Alcohol consumption was associated with poor blood pressure control. Daily intake of vegetables and fruits were associated with healthier levels of blood pressure, BMI, heart rate and cholesterol levels. Although pharmacological adherence was adequate suboptimal blood pressure control was observed requiring the addition of heart healthy lifestyle modification as part of the treatment plan. A small proportion of participants considered hypertension as preventable. This presents a compelling mandate to address modifiable risk factors by prescribing heart healthy lifestyle behaviours and antihypertensive medication adherence through locally tailored, expert delivered hypertension-related information and treatment. The authors would like to thank all study participants who took part in the study as well as Professor Eileen Stuart-Shor for her technical assistance with the manuscript editing. World Health Organization. A global brief on hypertension: silent killer, global public health crisis: World Health Day 2013. 40. Geneva, Switzerland: WHO Press, 2013. World Health Organization. Global status report on noncommunicable diseases 2010. Geneva, Switzerland: World Health Organization 2011.
. Epidemiology of cardiovascular disease risk factors in Ethiopia: the rural-ruban gradient. Epidemiologi och folkhälsovetenskap 2008.
. Snapshots of health systems: the state of affairs in 16 countries in summer. Geneva, Switzerland: World Health Organization, 2004.
International Diabetes Federation. IDF Diabetes Atlas, 7th Edition (2015). 2015 https://www.idf.org/component/attachments/attachments.html?id=1093&task=download (Accessed 19 Mar 2018). Kenya Healthcare Federation,. Task Force Health Care. Kenyan: Kenyan Healthcare Sector: Opportunities for the Dutch Life Sciences & Health Sector, 2016. Ministry of Health. Kenya Health Policy 2014–2030: towards attaining the highest standard of health. 2014 http://publications.universalhealth2030.org/uploads/kenya_health_policy_2014_to_2030.pdf (Accessed 4 Aug 2018).
. Lifestyle modification: is it achievable and durable? The argument for. J Clin Hypertens 2004;6:578–81.
. Research methods: quantitative and qualitative approaches. Nairobi: African Centre for Technology Studies (ACTS), 2003. National Institutes of Health. Diet history questionnaire. 2018 https://aghealth.nih.gov/collaboration/qx/dhq.pdf (Accessed 4 Aug 2018). International Diabetes Federation. The IDF consensus worldwide definition of the metabolic syndrome. 2009 https://www.pitt.edu/~super1/Metabolic/IDF1.pdf (Accessed 4 Aug 2018). GATS. Global adult tobacco survey. 2014 https://www.tobaccofreekids.org/assets/global/pdfs/en/GATS_Kenya_Fact_Sheet_2014.pdf (Accessed 19 Mar 2018).
. Prevalence of arterial hypertension in young military personnel and associated factors. Rev Saude Publica 2009;43:789–95.
. Gender differences in alcohol metabolism. Physiological responses to ethanol. Galanter M , ed. Recent dev alcohol. New York: Kluwer Academic / Plenum Publishers, 1995:163–79. World Health Organization. Global health risks: mortality and burden of disease attributable to selected major risks. Geneva, Switzerland: World Health Organization, 2009.
. Alcohol Consumption and the Incidence of Hypertension in a Mediterranean Cohort: The SUN Study. Revista Española de Cardiología 2009;62:633–41.
. Alcohol consumption and the incidence of hypertension: The Atherosclerosis Risk in Communities Study. Hypertension 2001;37:1242–50.
. Effects of alcohol reduction on blood pressure: a meta-analysis of randomized controlled trials. Hypertension 2001;38:1112–7. World Health Organization. Prevention of cardiovascular disease: pocket guidelines for assessment and management of cardiovascular risk. Geneva, Switzerland: World Health Organization, 2007.
. Fruit and veggies rich in potassium may be key to lowering blood pressure. 2017 https://news.usc.edu/119637/how-to-lower-your-blood-pressure-eat-more-fruit-and-veggies/ (Accessed 20 Mar 2018). World Health Organization. Potassium intake for adults and children: guideline. Geneva: World Health Organization, 2012.
. Adherence to pharmacologic management of hypertension. Can J Public Health 1998;89:I16.
. Results of the Diet, Exercise, and Weight Loss Intervention Trial (DEW-IT). Hypertension 2002;40:612–8. National Clinical Guideline Centre. Hypertension: the clinical management of primary hypertension in adults: update of clinical guidelines 18 and 34. London, UK: National Clinical Guideline Centre, 2011:861. Contributors SK, WM and MC conceptualised and designed the study and drafted the article. SK, OTO and SM acquired the data, carried out the analysis and interpretation of the data and participated in drafting the article. Funding This work was supported by funding from Kenyatta National Hospital research grant: KNH/23/22. Ethics approval The study was reviewed and approved by Kenyatta National Hospital University of Nairobi Ethical Review Committee (KNH-UoN ERC) and institutional permission was granted by the head of the Department of Medicine. Data sharing statement The datasets used and analysed during the current study are available from the corresponding author on reasonable request.